By LUDWIG VON KOOPA - Anyone who says that either doesn't know what an average is, or don't know how reviewers score games. Source: This GameFAQs comment in a thread about a 7/10 score given to The Legend of Zelda: Breath of the Wild by The Jimquisition. “7/10 is not average... 5/10 is average. I don't want to pick on just that one GameFAQs user, but it's fairly representative of the kind of person I see, and they're sort of everywhere. A minority, yes, but still prevalent. Full credit for the data and presentation to Lokno. You see that? So, if a 50/100 was really the average for review scores, you would see a bell curve, with 50 having the highest count. Half of the game scores be below 50, and half would be over 50. After all, being an average score means, in this case, you're in the middle (the median). If 5/10 were representative of an average game, then you wouldn't see the above. The average is around 70. It's clearly not 50. This Jim Sterling... guy, by giving The Legend of Zelda: Breath of the Wild a 7, is saying that The Legend of Zelda: Breath of the Wild is an average game by industry standards. Middle-of-the-road. It should tell you something that Movies, Television, and Music all follow one scale, while just Games has its own scale. 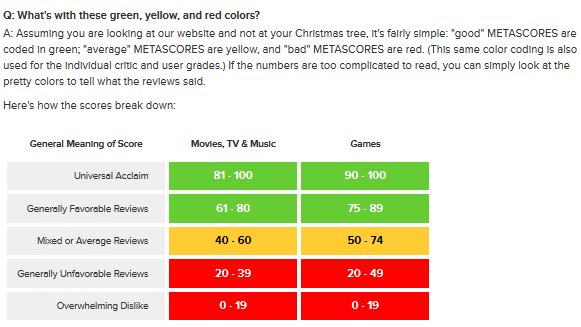 Obviously, that should tip you off that Games have their scores inflated from what you may be used to, and the average of the average score band (yellow) is 62, not 50. Obviously, if you're still saying a 5/10 is average, you're not looking at the evidence. And if you are a Metacritic-approved reviewer and you score based on a 5 = average scale, then you are jeopardising the Metascore of every game you review. I'm aware that people have different expectations of what these numbers mean. 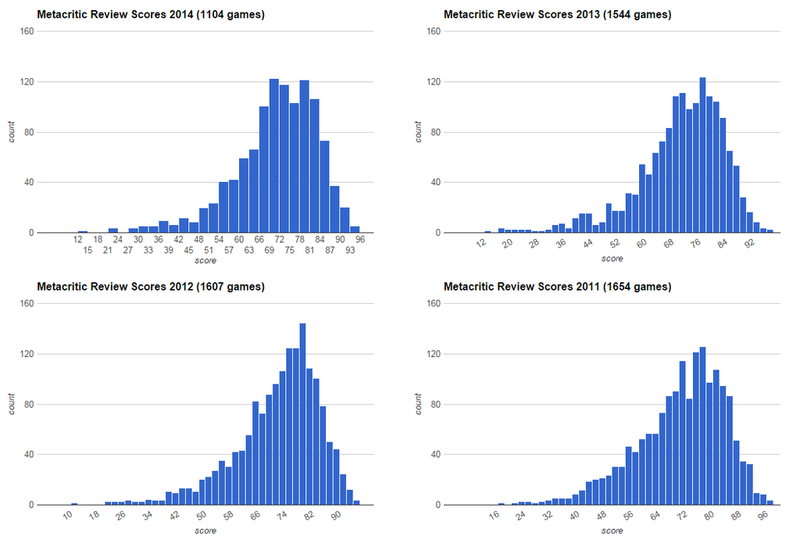 I'm not saying how Metacritic works or how game reviews work are good things. They're awful things and they're malignant to the industry, and that's why I don't give scores on the few games that KoopaTV reviews. Scores are arbitrary (how do you convert all of your complicated thoughts on a game into one number? ), a poor communicator of value (one man's notion of a 5 is different than another's notion of a 7), and encourage people to not actually read the review, but just look at the score (and people work much harder writing the review than coming up with the number). I've argued that critic reviews are becoming irrelevant to the general population, and to smaller niches of the gaming industry, they are already irrelevant. Unfortunately, the videogame industry itself still has things like awarding its development staff bonuses if they hit an arbitrary Metacritic threshold. As long as crap like that exists, critic reviews are not irrelevant, and critics need to be responsible with the power they hold. Readers need to use this resource responsibly as well. People who insist that a 5 is average are NOT being responsible. Ludwig, being the mathematical genius that he is, understands that mathematically, a 5 is average on a 0 to 10 scale. However, evidence from the field suggests that the scale used by reviewers is actually a 4 to 10 scale, in which 7 is the average. Don't doubt Ludwig's excellence with numbers. In the meantime, nothing in this article is to suggest that The Legend of Zelda: Breath of the Wild does or does not deserve the small handful of average scores it's been receiving, since Ludwig hasn't played the game. If you want to know which version of The Legend of Zelda: Breath of the Wild is right for you, review scores won't give you useful information. This article might. Jim Sterling was previously known on KoopaTV for writing Fake News about the New Nintendo 3DS. The author of the 6/10 Slant Magazine review of The Legend of Zelda: Breath of the Wild, Jed Pressgrove, previously gave the browser-based abortion adventure game Choice: Texas a 9/10. Even guest article writers are agreeing with the numbers-are-hurting-things thought in this article. I'd go as far as to say the numbers--at least on major review sites--are indicative of basically nothing save for what the DEVELOPING COMPANY PAID THE REVIEWER SITE TO GIVE THEM. Yes, I'm looking at YOU, IGN. There's a reason "ignorant" starts with those three letters. So how much do you think Nintendo paid out to all of these sites and magazines? But you're right, of course. To a point.